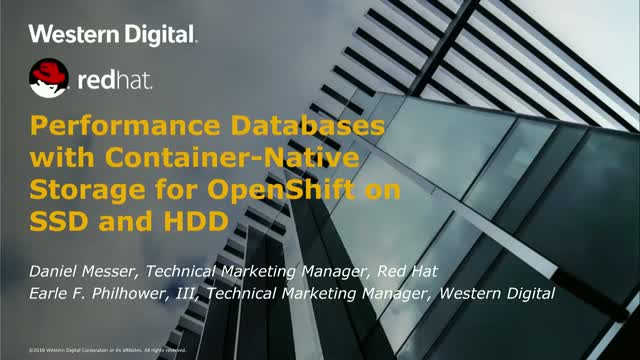 After the initial release of Red Hat’s container-native storage (CNS) solution for OpenShift, a large number of customers had one question: "Can I run a LAMP-stack database on this?" In this webinar, you will find the answer to this question in a first-of-its-kind performance benchmark on hardware provided by Western Digital. The goal is to investigate whether OpenShift, running on VMware, integrated with Gluster as container-ready storage could run MySQL databases, typically found on web application stacks in containers, at sufficient speed. And if so, what is the best storage hardware to use? How much can we push either the storage or container cluster to its limits? We'll share the findings and discuss designing an OpenShift solution suited for such workloads.